"You always forget... that the reliable machine always has to be worked by an unreliable machine." Last week, I reviewed Death Through the Looking Glass (1978) by Richard Forrest, which concerned itself with the shenanigans surrounding the discovery of a murder victim inside the wreck of a crashed airplane and the premise was reminder that there were a number of aircraft mysteries languishing on my TBR-pile – one of the more prominent ones being Christopher St. John Sprigg's Death of an Airman (1935). 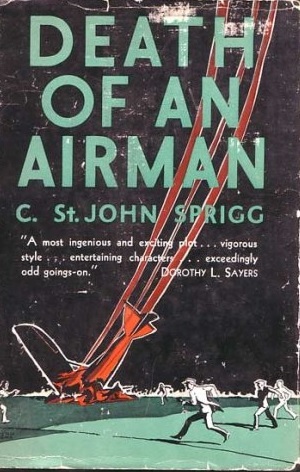 During his (short-lived) life, Sprigg earned his stripes as a versatile author and signed his name to poems, ghost stories and aeronautical textbooks. But where really garnered praise as a writer was during his brief stint as a mystery novelist. A short period of success that began with the publication of Crime in Kensington (1933) and ended five novels later with The Six Queer Things (1937), which were, incidentally, both listed by Adey in Locked Room Murders (1991). They were well received and garnered praise from the likes of Dorothy L. Sayers, who said his work "bubbles with zest and vitality" and stuffed with "good puzzles and discoveries," but his premature death threw them into obscurity – where they became scarce and expensive collector items. Thankfully, one of them has, once again, become available to us poor mortals! Last year, the Poisoned Pen Press, under the banner of the British Library Crime Classics, reintroduced Sprigg to the present-day horde of mystery readers with a brand-new edition of Death of an Airman. The first one to roll off a printing press in eight decades! 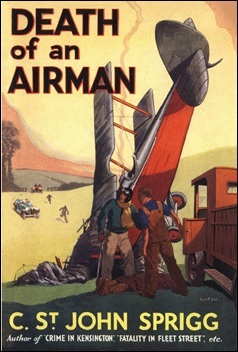 Death of an Airman largely takes place on the tarmac of the Baston Aero Club and the opening has them welcoming a fresh pupil: Dr. Edwin Merriott, the Bishop in Cootamundra, Australia, who wants to take flying lesson to travel from one end of his diocese to the other – which takes several weeks with then conventional ground-based travel. Upon his arrival, the Bishop immediately meets with some of the club notable members, which include the manager and secretary of the club, Sarah "Sally" Sackbut and Lady Laura. However, one of the most notable characters on the airfield is the scar-faced flight instructor, Major George Furnace, who's first seen when takes a young, inexperienced student, Thomas Vane, for a tailspin. He also creates a scene with another member, Mrs. Angevin, who is told by WWI fighter-pilot to stop "making every decent person's gorge rise" by turning herself into "a cheap circus." So this sets the stage for, what appears to be, a tragic accident: Furnace's aeroplane is seen doing air spins, when it suddenly loses height, as "the flickering toy vanished behind the trees." Furnace has crashed his plane and his body is found in the wreckage with a deadly head wound, however, not all is what it seems and here's where the medically trained Bishop makes his biggest contribution to the case – perceptively noting the lack of rigor mortis. A fact that's confirmed by the doctor some time later, but the whole affair truly begins to resemble an impossible crime when the pathologist extracts a bullet from Furnace's skull! The murder can be aptly described as a borderline impossible crime and the circumstances, in which Furnace perished, are genuinely baffling, but it's far from the only component providing a problem for the police. Inspector Creighton of the Thameshire Constabulary uncovers a potential blackmail angle with direct ties to a dope-smuggling organization, which peddles cocaine across the Channel from Continental Europe. So this leads Creighton to the desk of Inspector Bernard Bray of New Scotland Yard, who has been investigating "the white-drug traffic in Britain for the Home Office," which, in turn, leads to such places as Glasgow and Paris – where Bray receives assistance from M. Jules Durand of the Sûreté (a name closely associated with "the most wildly romantic trials of French criminology"). 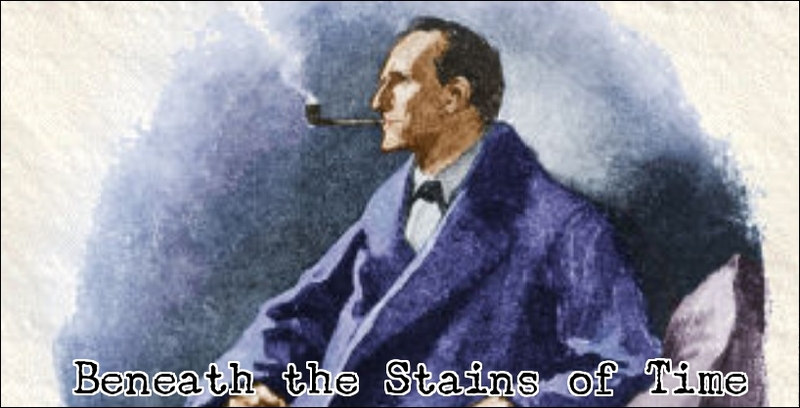 Well, there a lot of people working on the case or giving their two-cents, which provided the plot with a couple of false solutions, which are always fun, but the final explanation as to how the murder was accomplished was devilish cheeky. A piece of trickery that almost seems as impossible to pull off as the effect it ended up creating, but then again, the guilty party in this book always seem take the long way round in order to achieve their goals – whether it's the disposal of a potential dangerous person or smuggling illegal substances. It always has to be done as difficult as humanly possible. Not that I am complaining about plot complexity, mind you. But I can imagine some readers would be annoyed to learn Sprigg was being difficult for the sake of being difficult, because these crimes certainly did not came about organically. However, I don't want to complain about a complex and juicy plot. I've a reputation to think of! 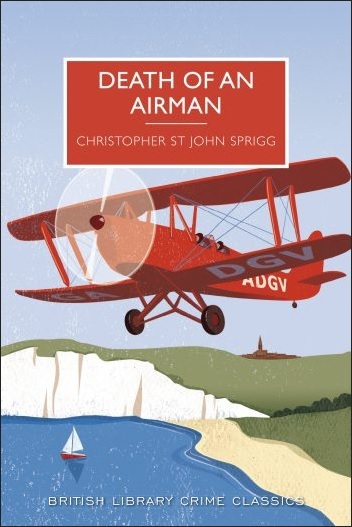 So, that being said, Death of an Airman is still a very well-written and plotted mystery novel, which also brings the author's insight and personal experience in aviation to the table. A field that has rarely, if ever, been explored by other Golden Age writers and this gives the book somewhat of a unique feeling. I genuine hope the British Library decides to republish his other mystery novels as well, because Crime in Kensington sounds like a must read for any self-respecting locked room fanboy. On a final note, I cranked out this review on a short time-limit. So that saved you (at least) a page-worth of vague, semi-coherent rambling and arguing with myself on whether or not the book qualified as an impossible crime. As you probably noticed, I decided to go with a borderline impossible crime and have not labeled this blog-post as a locked room mystery. However, the next blog-post may or may not be a review of a locked room novel. Who knows? Wait and see! Coincidentally, I just finished reading this title late yesterday evening. :) I enjoyed it, but wondered about the clues - in retrospect, most things seem to be hinted at, rather than clue-d. (Is that such a word as 'clu-ing'/ 'clewing'?) Until a certain quality of a certain individual was revealed, there seemed to be little way to make sense of the original crime... But the explanation was certainly clever. Well, yes and no. I should probably have delved deeper into that aspect (time restraint), but the crime was, technically, fairly clued. There were some observations made about the crash and these were referred back to when the case was explained, but the only problem is that correctly intrepeting these clues requires expert knowledge that most readers probably don't have. Yes, the revelation of that person should've been given (or hinted) at an earlier moment. Though my synopsis of CRIME IN KENSINGTON (aka PASS THE BODY in the US) may sound fun and enticing, I'm not sure it's for you, TomCat. It's a lot more farcical than this one, that's for sure, and the oddball characters and sense of humor keep it engaging. But knowing your penchant for deviously plotted impossible crimes and clever finales I'm sure you'd find the solution uninspired and underwhelming. Ah, that's a real shame. Not just your review of the book, but also Adey's description of the impossible situation sounded enticing, which struck me as potential original locked room trick. Oh well. In any case, thanks for the warning, John!